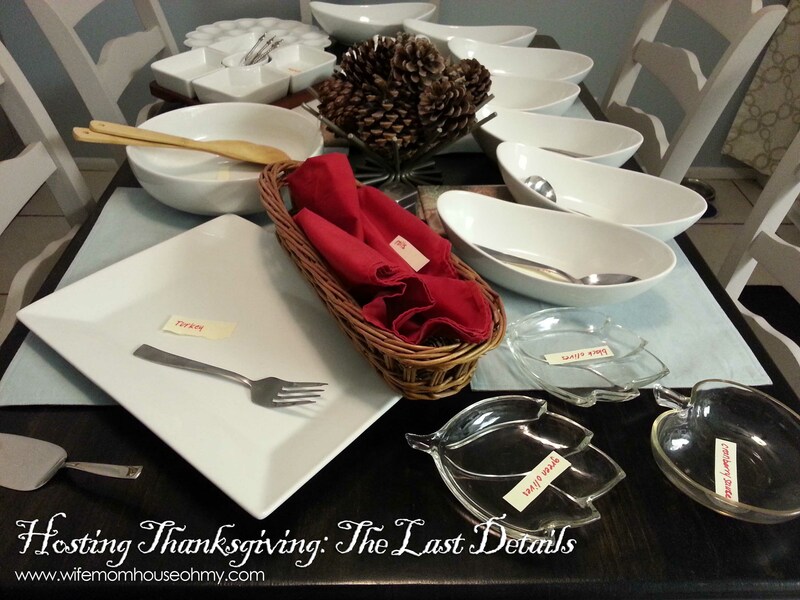 Okay, so really by last I am talking about those details you take care of in the last two to three days before Thanksgiving…or any party. For me, its all about pulling things together and doing anything and everything I can in the days before to save me time the day of my event, in this case family Thanksgiving. Again, the planner comes in handy and keeps me on track but it always comes down to executing it. The night before any big event, I find it extremely helpful to chill any cool beverages that I plan on severing. This goes for sodas, waters, teas, and especially white wines, champagnes and Sparkling Cider for those not over 21. If you are having beer, its also not a bad idea to pop some mugs in the freezer. If you haven’t already, making cold dishes are a simple way to save time the day of your event. Things from relishes, which can be made anywhere up to 3 1/2 days in advance, to cold served items such as olives, veggie trays (keep moist cloth overtop), butters on their serving trays, jams, cranberry sauce, etc. Also as I mention in my post on the meal, you can also prep your potatoes the night before too. About 2 to 3 days before a big event, I give my house a major cleaning. The upstairs private area gets it on the proceeding Saturday but the downstairs public gets a full and through cleaning closer to the big day. Two reasons: My family, other than my office, doesn’t really live upstairs and its really our private area, so a deep cleaning can take place sooner. Second, we LIVE downstairs from the kitchen to the family room, to the bath, to the living room and even the laundry room and garage. Dividing it gives me less stress, recognizes that in two days my family can’t do too much damage to the downstairs and it leaves very little the day off that I have to worry about as far as cleaning goes. In fact, it will be a quick check of baths, toilet cleaning, vacuum and light dust. In addition to cleaning the house, I check all my dishes, glassware, flatware and serving ware. Often times these can sit in a cabinet a far while between uses. So a day or two before I make sure they are dust free, clean and spot free. Speaking of clean, I also prefer a wrinkle free look so the linens – tablecloth, napkins, etc. – get a quick iron and wash if need be, again mainly because they site awhile in between use. That and I live in southern California with a major freeway exchange in my backyard and dust seems to find its way on to EVERYTHING! Oh, and the house and dishes are all that get a good once over with some soap and water. So will (and always have) my little adorable terrible twosome – my Yorkies Dolce and Chanel. Baths and a trim are always a must for these two bundles of joy and any more than two days before is a waste! Its sounds overkill but having done it with or without this next suggestion, I can say it is so not overkill. The night before I will set out every single serving dish and put a post-it with what goes inside each dish. This makes it so much easier than scrambling for a serving bowl or when others are helping in the kitchen. I also put the serving utensil with it so again I am not playing hunt and find while the gravy burns. I literally do this for as much as I can possibly do, (when I have been able to) in advance. Once ironed and cleaned, I will set the dinning table with the tablecloth, napkins, utensils, downsized table décor, wine and beverage glasses. 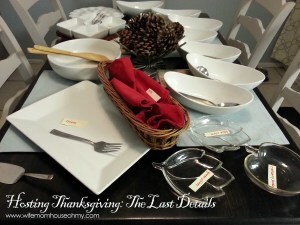 I also make sure the dessert items are ready for serving and I set out the appetizer plates and napkins. And don’t forget the salt and pepper shakers. If those are full, it could be a flavor mishap. I also shift the décor from the dinning table that I don’t used in my downsized tablescape to other prominent areas of my home to keep it feeling festive. I also figure out where I want the candles set so they can burn without disturbing people AND to hid the boy smell in my home. The last thing I do is look over my cooking schedule so it is fresh in my mind AND so I know when I have to get up. Then I pour myself a drink and relax. I hope you all have found these tips useful and I hope you all enjoy this season of thanks!